Starfish or Sea stars occur in all the oceans of the world, the greatest concentration of species being in the North Pacific. The waters of British Columbia, Canada, from Puget Sound to Alaska, are particularly rich in starfish. 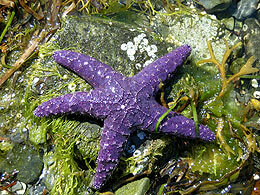 The Pisaster ochraceus or purple star is one of the most common sea stars found in the middle tide zone. Their natural colors vary from brown black to purple, orange and yellow. They have 5 arms and a heavy calcified body which is slow to change shape. They range from Baja California to Alaska and feed on mussels, barnacles, limpets and various snails. At low tide they can be found in tidal pools or anchored in rock crevices waiting for the incoming tide.